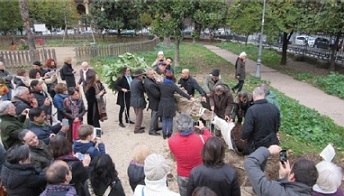 Rome, Italy: Italy’s ISKCON 50th anniversary celebrations commenced on November 25th, 2015 with the planting of a sacred Banyan tree in the historical garden of Piazza Vittorio in Rome. 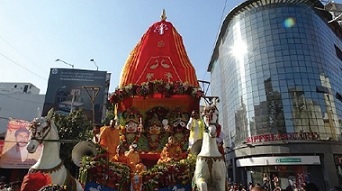 The Bhaktivedanta Cultural and Educational Library donated the tree to the city of Rome on the occasion, which was auspicious as it was also the 500th anniversary of Sri Chaitanya Mahaprabhu’s arrival in Vrindavan. Even more auspicious was the fact that the tree was originally brought to Italy in 1997 from Yoga-pitha, Sri Caitanya Mahaprabhu’s birthplace in West Bengal. 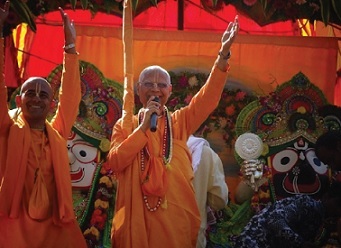 Sydney, Australia: “Pratapana and Jayasri are a husband-and-wife couple who run a very successful preaching center called Govinda’s ashram in Sydney,” Braja Vallabhi, a second-generation ISKCON devotee, says. “Jayasri is a great mentor for me, and her vision is that ISKCON 50 is not just about celebrating the past 50 years, but about looking forward and celebrating the next 50. And part of that is empowering the youth, and giving them the understanding that Krishna consciousness is fun.” To do this, Jayasri and Pratapana sponsored a bus, and Braja-Vallabhi and her peers agreed to organize a tour. Four people are set to represent Bhakti Without Borders, only the third kirtan album ever to be nominated for a Grammy, at the 58th annual Grammy Awards on February 15th. Los Angeles, CA, USA: Four people are set to represent Bhakti Without Borders, only the third kirtana album ever to be nominated for a Grammy, at the 58th annual Grammy Awards on February 15th. Main artist Madi Das – who duets on the album with eleven Vaishnavi co-vocalists – and producer Dave Stringer will attend as the Grammy nominees. 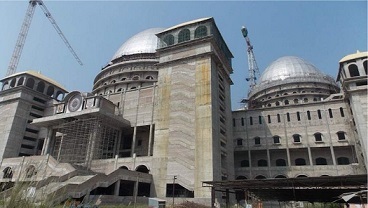 Mayapur, WB: The superstructures of all three domes of ISKCON’s upcoming flagship temple – the Temple of the Vedic Planetarium in Mayapur, West Bengal – have been completed, and finishing work is now underway. At its highest point, the temple will stand 113 meters (370 feet) tall, higher than the Taj Mahal and St. Paul’s Cathedral in London. The main center dome is 58 meters (198 feet) high, while the two side domes are both 30 meters (98 feet) in height and will stand taller than Srila Prabhupada’s Samadhi in Mayapur.